• To increase patient referrals to ISPS members from tens of thousands of law enforcement agencies. 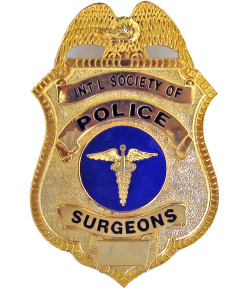 • To increase the number of qualified police surgeons available to the law enforcement community. • To provide courses on current forensic techniques and expert testimony, as well as all aspects of forensic identification. • To create a referral base of healthcare professionals who can be called upon by local police departments, coroners and medical examiners' offices. • To create a global directory from which all law enforcement agents can receive quality medical care on a rountine and emergency basis worldwide. • To promote the status of police surgeons, making sure all police departments are aware that there are ultra-qualified healthcare professionals that make their time available for them. • To have a minimum of one healthcare provider as an ISPS member in each specialty (i.e. medicine, dentistry, psychology, etc.) in every county of the United States.